Homepage. 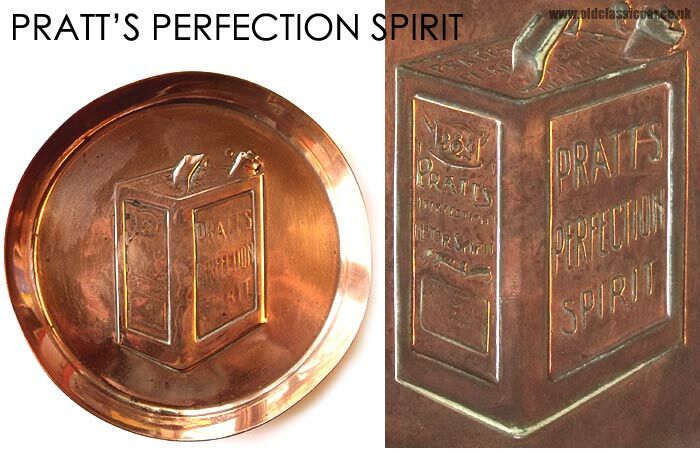 This page: An unusual copper promotional dish, advertising a blend of Pratt's petroleum from the 1920s. This circular copper dish measures 4.5 inches in diameter, and was found late 2009 in a Yorkshire antiques shop. It features an image of a 2-gallon Pratts Perfection Spirit petrol tin, of a type that was commonly used for the distribution of car fuel in the 1920s and 1930s. Whereas old tins featuring the Pratts name turn up quite often, I've not seen a small dish like this before. It has been polished many times, removing some of the detail. Fortunately the missing detail can still be made out on the underside, so this too was photographed, and flipped, to show a little more of the design. The Pratt's name appears in several locations on oldclassiccar (not least in the petrol & oil company memorabilia section), as parent business - the Standard Oil Company - were one of the more prolific of motor fuel producers in the vintage era. The Standard Oil Company began the distribution of motor fuel in Britain in 1896. The Pratt's name originated from one of the firm's directors, a Mr Charles Pratt, and was used throughout the 1920s and 1930s, finally being replaced in 1935 by "Esso". Photographs on this page of the site, show a vintage car being filled up with Pratt's motor spirit, at a garage that once existed in Cheadle, Cheshire, in the 1920s. 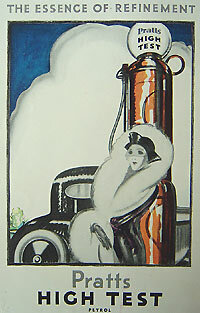 The advertisement on the right promotes Pratt's "High Test" motor fuel, illustrated with a smart lady, her motor-car, and a fine old petrol pump towering above them both. As more items relating to Pratt's turn up, I'll add them in here. Invoice for Pratt's Motor Spirit. The Motor Spirit supplied against this ticket is sold exclusively for the Buyer's own use as a commercial customer. It is a condition of sale that it is not to be used in private cars, re-sold or transferred to private users. In the event of any infringement of this rule, the Company will decline to continue deliveries and will refer the buyers for further supplies to the ordinary trade channels at retail prices. So woe betide any garage owner who bought this fuel at a heavily-discounted rate, only to put a gallon or two in the back of his vintage motor-car. The following note also confirms that the order of 200 units was for 200 2-gallon tins of Pratts spirit. Owing to the volatile nature of petroleum spirit the Company cannot guarantee that each can when delivered contains the quantity originally measured, although every precaution is taking when filling cans to see that full measure is given. Customers are therefore invited to check each can at the time of delivery as no claim for shortage can afterwards be considered. 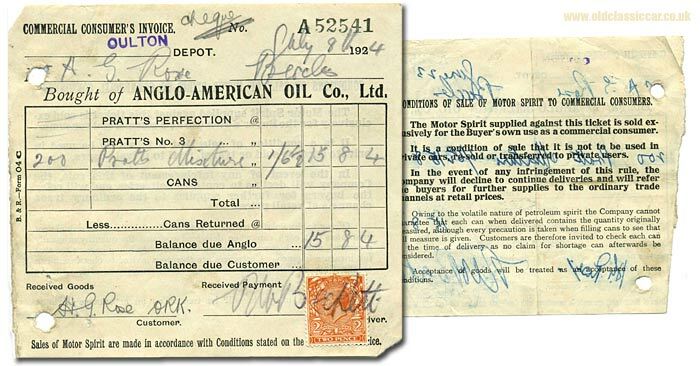 This invoice was issued by the Anglo-American Oil Company Ltd, originally a British off-shoot of the Standard Oil Trust in the USA, later a part of Standard Oil of New Jersey.